« Are wine recommendations important? 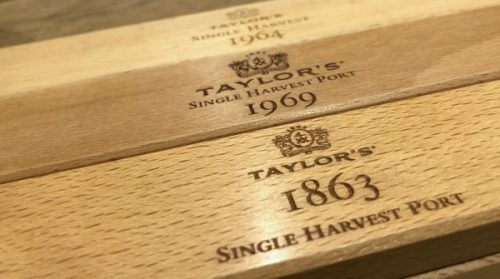 Port house Taylor’s have begun releasing Colheita Ports. They label these ‘single harvest’, which is an English way of saying that they are Tawny Ports, matured in wood, from a single vintage. The release program, now in its 6th year, has focused on selling wines that are 50 years old, so that people can buy them to celebrate this momentous birthday with a birth year wine. It’s a clever idea, and the good thing is that because Tawny Ports are aged for a long time in cask and then bottled just before sale, you know the wine will be in a good condition – there shouldn’t be any bad bottles. They are priced around £200 each. But there’s also been a relase of the 1863 vintage, which is a special opportunity to connect with the past. The world was very different then. And it was before phylloxera reached the Douro. What I would give to be transported back for a day or two just to see how different things were then (although I’m not altogether sure that the Douro of 1969 would be all that changed from 1863). The 1863, from the last great vintage before phylloxera hit the Douro, is an astonishing wine, and retails for around £3000. In those days, Port didn’t have the current classification into Vintage and Tawny.